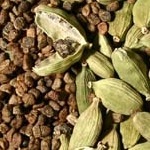 Cardamom belongs to the ginger family. Fruits and vegetative parts of members of this family are usually 'hot'. 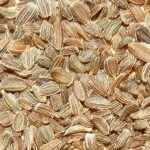 They are much used as spices, and also utilized in folk medicine. In addition to cardamom, ginger, Zingiber officinalis, galanga, Alpinia galanga, and turmeric, Curcuma longa, should be mentioned. used in perfumery for special effects. 1,8-Cineole (eucalyptol) and alpha-terpinyl acetate are the major ingredients , but trace amounts of certain unsaturated aliphatic aldehydes are important for the typical aroma, e.g. (E)-4-decenal . This aldehyde (available from Bedoukian Research, Inc.) is an extremely powerful odorant with a truly extraordinary diffusivity. One drop on a blotter will make a large room smell of freshly crushed cardamom seeds in a few minutes! 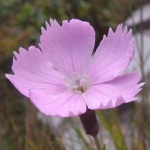 Most species of the genus Dianthus are belonging to the Mediterranean area. 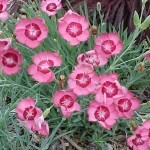 Carnation, Dianthus caryophyllus, a native to the Near East, has rosy petals and light blue-green leaves and stem (left photo). 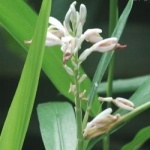 It has a powdery and spicy-sweet vanilla-floral odor and is a classical item of reference in perfumery. Numerous garden varieties and hybrids have been developed (three next photos). Unfortunately however, as with other olfactory jewels (e.g. hyacinth and rose), the selection for improved looks and longevity is often accompanied with an impairment of the scent of the flowers. 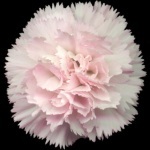 Southern France, Italy, Egypt, and Kenya have been sources of carnation flowers for perfumery use. The flowers were extracted with volatile solvents, yielding a so-called carnation concrete, which on treatment with alcohol gave the so-called absolute. 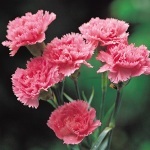 However, the yield of carnation absolute is incredibly small and thus extremely expensive. Today it is only manufactured on a very limited scale. During the 1980s more than hundred components were identified in Egyptian carnation absolute. A smaller number of compounds predominate: eugenol, phenethyl alcohol, linalool, benzyl benzoate, (Z)-3-hexenyl benzoate, benzyl salicylate, and esters of higher aliphatic acids . The biological purity of these chemicals, and their surrounding by a multitude of trace components, are responsible for the softness of the scent of carnations. The carnation was used as the symbol of the non-violent Portuguese Revolution in 1974. Soldiers were seen with carnations stuck into the barrels of their rifles. Etymology: Gr. dios anthos, the god's flower (Zeus). Lat. caryophyllus, the original Latin species name of clove, with which carnation has an olfactory resemblance. Although the carnation scent as such is out of fashion in perfumery these years, the sweet-spicy carnation accord is frequently part of both women's and men's fragrances, and will remain so in the future. A number of compounds with a carnation character have been invented, supplementing the above stated naturals. Only two shall be mentioned here: benzyl isoeugenol, or 2-methoxy-1-(phenylmethoxy)-4-(1-propenyl)benzene, a solid with a balsamic note and a powdery carnation-like sweetness, and Methyl Diantilis ® (Givaudan), or 2-ethoxy-4-(methoxymethyl)phenol, which has a sweet-smoky odor with powdery aspects reminiscent of carnation. 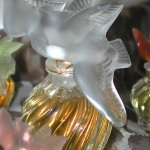 Countless perfumes include a more or less pronounced carnation theme, a famous example being L'Air du Temps (Nina Ricci 1948) - its characteristic flacon is seen in the last photo. 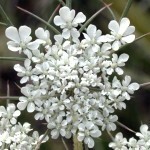 Most umbellifers are aromatic, and their seeds often have cavities with essential oil (see also angelica, anise, caraway, celery, coriander and cumin, for example). Carrot seed oil is obtained by steam distillation of the crushed seeds of cultured varieties of carrot. 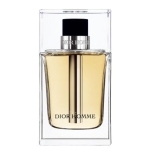 Refined qualities of this oil are especially suited for elegant shadings of men's perfumes. The main constituent of carrot seed oil is the sesquiterpene alcohol carotol, which may be present in over 50 % concentration . 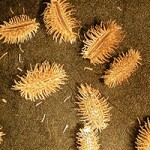 The seeds of wild carrots have stiff hairs, whereas these are absent in cultured varieties, see photos (enlarged). Etymology: Gr. daucos, umbellifer; Gr. karoton, carrot. 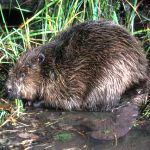 The constituents of castoreum partly reflect the food of the beaver. Alkylphenols like 4-propylphenol and ethylguaiacol together with cinnamic acid and salicylic acid derivatives are the main components. Some rather exotic nitrogen-containing compounds in low concentration are important for the odour . The tetramethyl-isoquinolinone shown is also present in tobacco, Nicotiana tabacum (Solanaceae). 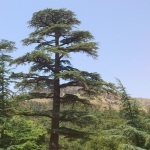 The true cedar is actually three closely related species growing in the Atlas Mountains in northern Africa (Cedrus atlantica), in Lebanon and Cyprus (Cedrus libani), and in the Himalayan range (Cedrus deodara), but for unknown reasons the natural forests have nearly disappeared. The most famous cedar forest in the Bsharreh region in North Lebanon, for example, now includes a mere 375 trees, the last survivors of the immense forests that lay across Mount Lebanon in ancient times. True cedarwood was formerly of cultural importance, and the biblical cedarwood used for making temples and ships originated in Lebanon. The tree is depicted on the Lebanese flag. 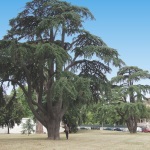 However, the cedar shows its majestic stature in many European parks. The lower left photo is from the Fontana dell'Acqua Paola in Rome (with the author of this site, in miniature, leaning against the tree). Moreover, some replantations are in progress. 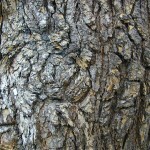 Cedarwood has a fine scent from its fragrant resin. 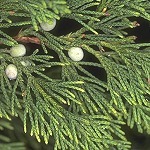 Cedarwood oil, e.g. from Atlas cedar, is obtained by steam distillation of the comminuted wood. 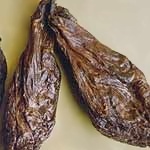 It has a very rich and aromatic resinous-woody odor. Its major constituents are the himachalenes, himachalol and atlantone   . 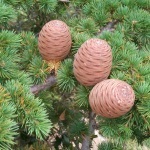 A large variety of trees and shrubs are also called cedars. Three members of the cypress family are of importance in perfumery, and the (so-called) cedarwood oil of commerce is from the wood of these species. 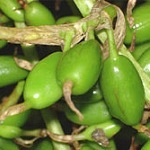 It contains about 30 % (+)-cedrol, alpha-cedrene and other sesquiterpenes which are used for the synthesis of advanced odorants of the 'precious-woody' and ambery types . 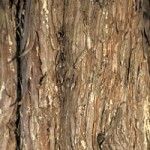 Red cedar (photos) is also called 'pencil cedar'. 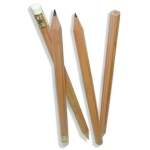 It is the wood of choice for making pencils. Notice the smell of your pencil!